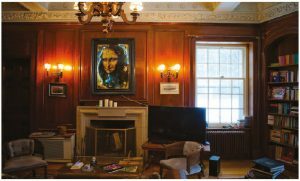 When deciding to bring his love affair with wood into his home, lumber baron Robert L. Blackburn clearly realized that some discretion was in order. 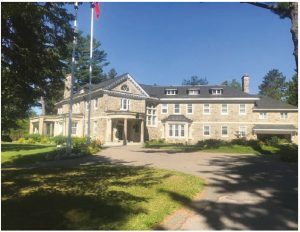 Blackburn built the stately hilltop mansion on chemin d’Aylmer in Gatineau next to the tony Royal Ottawa Golf Club in 1924. It has been the official residence of the Italian ambassador to Canada since 1956. Cut-stone outside, the home features ample wood inside: a gleaming oak staircase in the foyer, mahogany in the capacious dining room, deep walnut panelling in the masculine library, richly polished floors throughout. 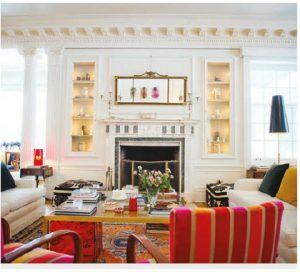 But despite its abundance, strong classical elements, including elaborate plaster work, counterbalance the wood and make it clear that this home is eminently civilized and not a wild woodland. 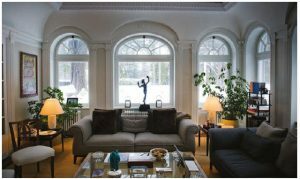 The ambassador’s favourite space is a former conservatory that he and his wife have converted into a sitting room, part of the gentle modernizing they’ve undertaken. The room overlooks the garden, deep in January snow when we visit. “Every morning I read the newspaper here because it has the best light,” he says. 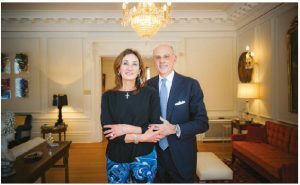 The ambassador and his wife call it their “elephant room” because of the large carvings and other items they’ve displayed from their posting to Mozambique in the mid-1990s. It might also be called the squirrel room. One of the rodents snuck in last year, and the ensuing contest between it and Stajano turned epic. Snatching up a chair, the exuberant lady demonstrates how, like a lion-tamer minus the top hat, she fended off the animal. Jab left, jab right. Realizing who it was up against, the squirrel turned tail and ran. Unfortunately, Stajano broke her foot in the standoff. Like her husband, Stajano loves the home, which Blackburn himself designed with the aid of John Pearson, the architect behind the rebuilding of the Parliament buildings following their destruction by fire in 1916 (there’s evidence the stone for the home’s exterior and the Parliament buildings even came from the same quarry). Her preferred spot is the drawing room. 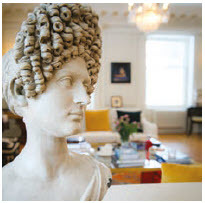 It runs almost the length of the home and features a Carrara marble fireplace she likes to sit beside. Overhead, two large crystal chandeliers punctuate the ceiling with its elaborate plaster work. 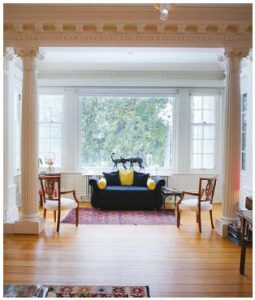 Cornices top the doorways, and there’s a cosy bay window area at one end, set off by Corinthian columns. If Blackburn kept his ardour for wood in check throughout most of the home, he let loose in the library. Floor-to-ceiling walnut panelling, built-in bookshelves, windows deep set in dark wood: the room, even if it is of its time, is like an open book about its builder. Above the wood-burning fireplace (you expected gas?) hangs a large da Vinci-inspired work. It’s by the contemporary Italian artist Dicò, who works with photography, Plexiglas and fire. This piece features the image of da Vinci’s Mona Lisa, though it’s much larger than the tiny original that hangs at the Louvre in Paris. Stajano says it reminds her of the couple’s 23-year-old daughter, who is studying in Italy (their son, 17, is studying in Ottawa). The dining room, set at an angle to the rest of the home, is also all about wood — dark, burnished, powerful without being too overwhelming. 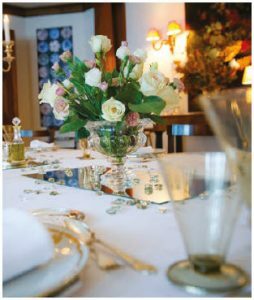 The table seats a dozen or more, while an oval ceiling medallion above incorporates designs of Canadian flora. Stajano says she and the residence cook often work together to prepare dishes such as Babà Napoletano, a brioche-style dessert, when guests are coming. Patrick Langston is an Ottawa writer who dreams of living in a manor.